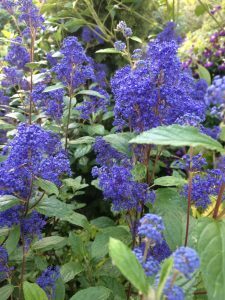 Possibly the darkest blue flowering cultivar that blooms in the summer. This hybrid is technically supposed to be deciduous but for us it never has been. 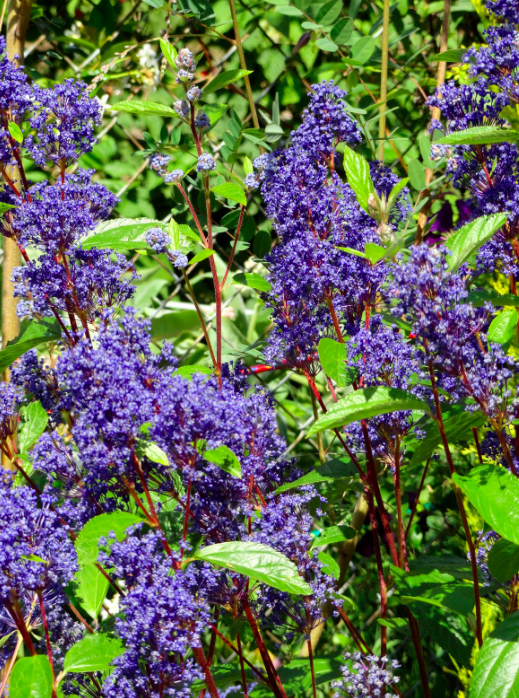 Large panicles of cobalt blue flowers erupt from the current seasons growth in June to July. Remove spent flowers and more may follow. To 5′ x 3′ in average to enriched soil with REGULAR summer water. Good drainage. Easy to resize as it blooms on new wood, it may be cut to as low as 18″ in early spring. Black seed capsules follow the flowers and persist until birds relieve them of their contents in autumn. Excellent in borders, as a specimen, or informal hedge-row. Not as drought adapted as most of the genus. This plant is best with consistent moisture through its bloom period- not boggy (ever) but consistent. Remarkable flower color- moody, deep indigo.